It sure is. For 30 years now we’ve come to know Springfield as almost a second home. It’s Nuclear Power Plant, Elementary School, Kwik-E-Mart. It’s long standing feud with Shelbyville. We know that the Springfield Tyre Fire can be smelled in 46 states, and we know not to get too close to the Lard Lad Statue in the event of a lightening storm. All of this to say, the sights of Springfield are as recognisable as say the Leaning Tower of Pisa, or the New York Skyline, and this LEGO Architecture version by MOMAtteo79 is instantly recognisable. 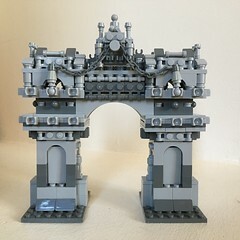 “In this creation I merged the passion for architecture sets, TV and LEGO and I created it for myself and only afterwards I thought of submitting (to LEGO Ideas). 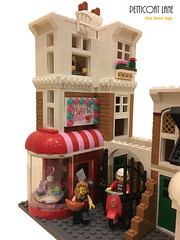 At the beginning LEGO also rejected the submission because of the licensing problems but I pointed out that license is no longer active or listed in their page so the project passed. 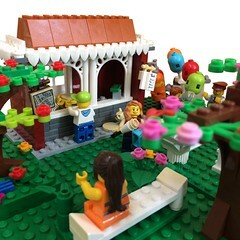 The most difficult building to create was… the church… that is not in the Ideas version because it was not accepted by LEGO’s policies. This is kind of normal with LEGO (no religion, but I didn’t realize it when submitting), but strange at the same time because the Venice Skyline set has San Marco! With the church out of business I wanted to resubmit asap and I quickly came up with the donut statue and the small Lard Lad building that indeed I think is the less inspired of the layout and was discarded in my first version ;). I really hope that a lot of people sees my creation not just to make them support it but because I also think that merging a realistic theme like architecture with a cartoon/fantasy/etc. theme is really a good idea that LEGO should use in the future (and I cannot say I was the first to think about it of course 🙂 ). 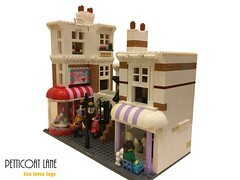 Imagine a Lord Of The Rings skyline or a Back To The Future one with e the clock tower or an Harry Potter one or an architecture scale Hogwarts …something that LEGO fans but also customers that normally are not into LEGO will buy because they like the theme. You’ll find The Simpsons Architecture Skyline on LEGO Ideas here – it’s a really great idea and highly deserving of a vote. You’ll also find some great Game Of Thrones Architecture Skylines on Matteo’s Flickr account here.